Here I specifically want to think about what we learned about competence from the competence-induced cultures (cells transferred from sBHI to MIV). We sampled cultures at the T=0 point indicated by the star in the above diagram, and the 10, 30 and 100 minute times in MIV. I'll also consider the results for strains with knockout mutations in the competence-regulating genes sxy and crp, but not for the toxin-and antitoxin mutants or hypercompetence mutants. I'm working on this because it will be a section in our manuscript about the competence-induced toxin-antitoxin system we've discovered. 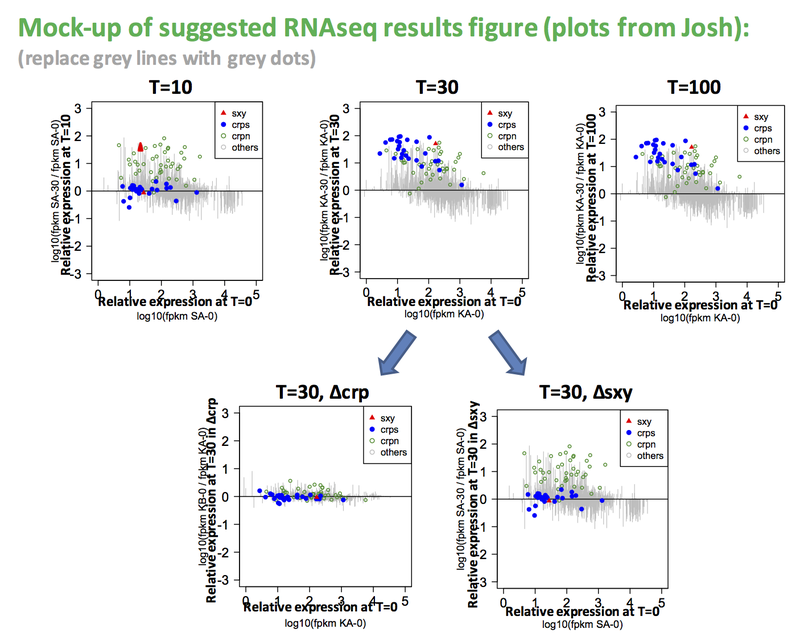 After describing what the RNAseq results tell us about the general features of competence regulation, the manuscript will go on to describe what they tell us about expression of the toxA and toxT genes. About 15 years ago we used microarray analysis in a very similar study (Redfield et al 2005); the diagram above shows the sampling strategy from that work. 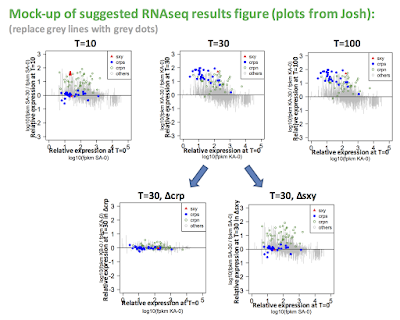 Here I want to focus on how the new RNAseq results affect its conclusions - what's strengthened, what's changed. This will be the first time we've described the RNAseq work in a publication, so it's important to present the basic information about the study. Eventually there will be a second paper describing the the effects of the hypercompetence mutations on 'spontaneous' competence development in rich medium. 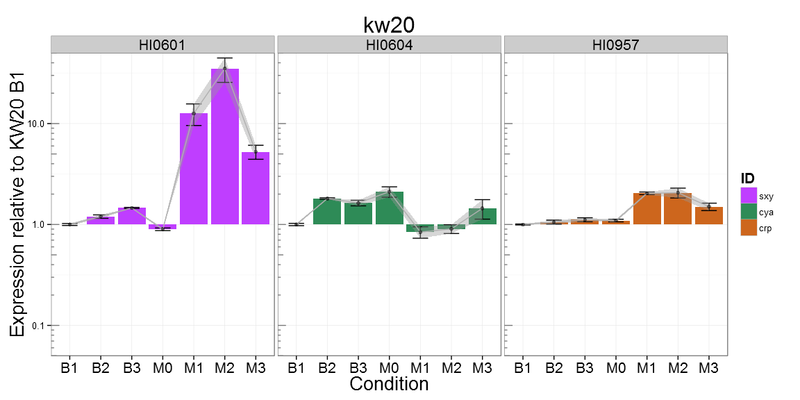 Because the T=0 samples were taken just before the cells were removed from rich medium, at OD600 = ~0.25, they give us gene expression levels for log-phase growth (when the growth rate is maximum, not limited by competition with other cells). If we want we can strengthen these conclusions by also using data from the other 'arm' of the RNAseq study, because this took samples at a lower cell density (OD600 = 0.02). If cells at both densities are truly in log-phase growth, their patterns of gene expression should be the same. If they're not, this becomes a topic for the hypercompetence manuscript, not here. A former Honours undergrad did a great deal of analysis of this work, and left us with excellent graphics and the R scripts that generate them. Below I'll illustrate the findings with his figures and some the former postdoc made, and discuss whether we need to generate different ones. Here's a graphic showing the relative expression of every CRP-S gene in the four time point samples (M0 is T=0, M1 is T=10 min, M2 is T=30 min, and M3 is T=100 min). (Oops, I cropped off the Y axis - it's a log scale going up to 10^3, with the X axis crossing at 1.) So we see that all genes are induced (most by 10-100 fold) at 30 min, and mRNA levels stay that high through 100 min. Here's a figure showing how the regulatory genes change. (Ignore the bars for the sBHI time points B1, B2 and B3.) Basically, sxy mRNA is strongly induced within 10 min (M1), well before the CRP-S genes in the graphic above, and cya and crp expression changes only slightly. The sxy mRNA isn't efficiently translated to Sxy protein unless purines are depleted. The drop in cya expression on transfer to MIV is expected, since it is known to be negatively autoregulated by CRP and cAMP. The small but significant rise in crp mRNA was also seen in the microarray study - it's cause isn't known. Here is a mock-up of an overview figure suggested by the former postdoc, with not quite the right data. It illustrates how competence gene expression changes after 10 min, 30 min and 100 min in MIV, and how the 30 min changes are altered if sxy or crp is knocked out. The tips of the grey lines represent expression changes of all the other genes; they'll be replaced by grey dots in the final version. The big question is: How does this advance on what we already concluded from the old microarray data? I think I had better printout and carefully reread that paper, rather than relying on my memory. How will contaminating Rd reads map onto NP?